What did you think of Madonna's Super Bowl halftime performance? 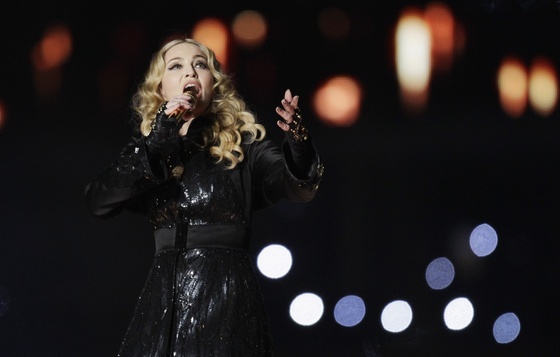 Posted on Mon, Feb 6, 2012 : 7:54 a.m.
Madonna performs during the Super Bowl halftime on Sunday. It's not every day that the Super Bowl halftime show is headlined by a former University of Michigan dance student. But that's what we saw last night, when Madonna did the honors. Tue, Feb 7, 2012 : 6:33 p.m.
She is, was and always will be talentless! I have never understood the appeal. How about Alicia Keys, Bob Seger.....anyone who doesn't need all the &quot;shock and awe&quot;...in other words...anyone with talent! Tue, Feb 7, 2012 : 2:37 p.m. So...how doe you spell t a c k i e ?? Mon, Feb 6, 2012 : 9:42 p.m. Liked it. Great presentation on all levels. Never paid a lot of attention to Madonna but after that performance ....the lady has talent! Mon, Feb 6, 2012 : 7:15 p.m. Didn't watch it. I will never get those minutes back, so I spent them on something more important. Which I guess, is anything else, really. Mon, Feb 6, 2012 : 6:38 p.m.
Mon, Feb 6, 2012 : 5:28 p.m.
How about...no halftime show at all? Does anyone really care who they trot out to fill those empty minutes between halves? Mon, Feb 6, 2012 : 4:57 p.m.
People keep complaining about who they are choosing for Halftime Shows... but who SHOULD they use? They need artists that are of a certain level and have as broad of appeal as possible. Who's big enough to pull it off, popularity + talent + age of fan basis wise? You got a few pop or hip pop acts (beyonce, gaga, jayz, kanye, em, the horrible black eyed peas), but after that - WHO? A country act? A big cruddy modern rock act? Who could pull it off? I'd prefer a younger act, but there are very few who could bring THE BIG TIME needed for this spectacle. Having said that... I usually go to the bar or the fridge at halftime so... lol It's just an interesting conversation to me. I think having older acts points out how there is a lack of truly HUGE artists now. Part of it is how pop culture is so vast now, THEE all powerful pop star above all others is next to impossible to achieve. (ie You can only get so big. A Gaga will never be as all powerful as a Madonna, because the culture has more choices in their face in the internet age.) But I also think that part of it is... the music isn't as good. lol It might be good - but these acts of the past few years (The Stones, Prince, Madonna, U2, Paul McCartney, Tom Petty, etc) - they cross genre and generations because their songs and value are off the charts GREAT. Super Bowl wants that mass appeal. Not sure if younger artists of RIGHT NOW can fit that bill as well. Just a few thoughts. Mon, Feb 6, 2012 : 3:44 p.m. I received a tweet last night that summed it up for me: The best part of Madonna's performance was when she disappeared! This joins a long line of lame Superbowl halftime performances. Mon, Feb 6, 2012 : 3:02 p.m.
Boring- Had to turn channel, was way too long. Too much pageantry and not enough talent, but at least she didn't embarrass everyone by being raunchy. Looked like a Fifty some year old woman trying to relive her past..and failing. It kills me to think that so many with real talent never get the recognition that these lip synching cookie cutter types get. I guess it just says something about American tastes...kind of bland. I wonder how much that whole thing cost. Mon, Feb 6, 2012 : 2:21 p.m.
Mon, Feb 6, 2012 : 2:18 p.m.
Old songs, lip-synced, piped in sound, the whole thing seemed fake. And the entrance was more or less copied from Lady Gaga. Mon, Feb 6, 2012 : 5:09 p.m.
Mon, Feb 6, 2012 : 4:44 p.m.
@daytona: I think you might want to youtube some Madonna clips. lol It wasn't Madonna aping Lady Gaga - it was Madonna aping her younger self! Which is what A LOT of people - including and especially Lady Gaga - do. JUST SAYIN'. But yeah... I think Ceelo was actually singing. That was at least nice to hear. Mon, Feb 6, 2012 : 3:55 p.m.
No you have it wrong Lady Gag copies Madonna they both stink. Mon, Feb 6, 2012 : 3:49 p.m.
@Craig, you are correct, that's why it seemed so strange to have Madonna taking a page out of Gaga's book. Mon, Feb 6, 2012 : 2:39 p.m. I like Lady Gaga, but it has been argued that Lady Gaga's entire career to date is a copy of Madonna. Mon, Feb 6, 2012 : 2:08 p.m. It understand it is difficult to do a TV stadium concert and avoid lag or echo, but live sound would have been nice. I was pleasantly surprised by the production and Madonna's performance, her guest star was classless but I hope that was unscripted. Mon, Feb 6, 2012 : 2:04 p.m.
Mon, Feb 6, 2012 : 1:46 p.m. I'm surprised that nobody cares that she (and every other dancing singer) lip-syncs. I guess I'm old school; I like live performances like U2 where the sounds I'm hearing are actually generated by the musicians on stage. Mon, Feb 6, 2012 : 6:42 p.m.
Mon, Feb 6, 2012 : 1:54 p.m.
Me too - and that isn't old school - it's just right. Mon, Feb 6, 2012 : 1:40 p.m. Lacked energy, was stiff and geriatric. YAWN! But hey, I have yet to see a halftime show that is any good. Black Eye Peas last year, equally sucky. Mon, Feb 6, 2012 : 2:10 p.m. I agree totally. did not look like was in high gear. Mon, Feb 6, 2012 : 1:37 p.m.